GardenStew Upgrade - What's New? Discussion in 'Site News' started by Frank, Feb 5, 2015. I'm so happy to finally welcome you to a new look GardenStew! There will undoubtedly be changes to your everyday Stew routine so apologies for that in advance. - Viewing updated threads takes you to the latest unread post, not the last post in the thread. There is so much to write about just in one post and I've just been sitting in front on this computer for 8 hours straight So I'm going to make a cup of tea. Please ask any questions you have below. I'm sure there will be many! Thanks so much for your patience today and please let me know if you are having trouble signing in to your account. Gail-Steman and Jadenz like this. 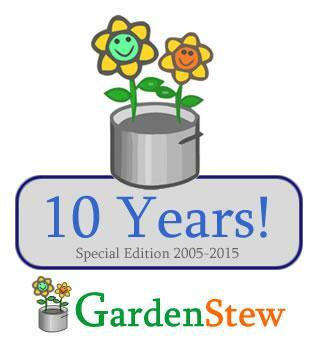 GardenStew is 10 Years Old! Win Special Mug or T-Shirt! Hi Frank, Hope you are enjoying a bit of down time with your tea. Thank you so much for all the work you do for us at GS. I would think something slightly stronger than tea would be in order Frank,after 8 hours in front of a computer! Thanks for the new-look site. I'm really glad to see multiple photo uploading,now all I have to do is find something to photograph. No complaints from me as I love the new look and features Frank. You work so hard on our behalf and each and every one of us appreciates all you do. I hope you enjoyed that cuppa and will get some rest soon. Thank you. I'm back, and I'm happy! Thank you Frank for making the upgrade so quick and relatively painless (for us, not for you!). I think your tea should be called Glenlivit . . . . It was so fast that it was here last night and the new one was here this morning. I'll find my way around but it may take a few days. I have a picture to post but have to change the size first. Should go and have another try at it. Some days my mind takes a little more time to figure things. This is going to take some getting used to!!! Excellent work Frank - You rock, (specially when it comes to large size picture uploads)!!! But one thing isn't quite to my liking... The old greenish theme was (in my opinion) somewhat better looking then this one. This really has too much empty white color area on the screen, (way too much). While the old greenish theme could easily be identified with plants and trees, as it had a very bright yet comfortable natural look. And so was very comfortable on the eyes... But this isn't as friendly as that. Anyhow this theme bothers me on this account, as my monitor is a very big widescreen one. And my room is deliberately kept very dark (plus my PC's operating system's theme is also dark) - Although this works out great when I am doing my usual AutoCAD stuff (where the background is usually kept black, to symbolize infinite depth). But anything that has too much white in it, really starts to hurt the eyes over a period of time... Perhaps it's just me, as I grew up in the 1980's and 90's (watching re-runs of the original Star Trek, as well as ST The Next Generation), and so think that computers and monitors must always have colorful glowing lights on them (blinking in and out of sequence), and should be placed in a dimly lit area as well. But on a bit serious note also, white really is a very unfriendly color for me, makes me feel as if I am in a hospital or something... Culturally speaking also, white is a color (in my part of the world) that is sometimes associated with death and funerals, (which is why nobody would dare ware anything white on weddings and at other festive occasions). So giving the members an option to customize the color theme would indeed be a very nice thing to have. That way nobody gets to have their say on this issue, but can rather optimize it to our own liking! Thank @eileen, @marlingardener, @Netty, @dooley, @Shawchert, @Kay, @KK Ng and @S-H Glad you like it! I think your tea should be called Glenlivit . . Thanks MG, however I try not to "drink and keyboard". Hi Frank! Just noticed I am now a 'mighty oak'?